America's mid-20th century love affair with the Biblical epic began with Mervyn LeRoy's Quo Vadis (1951). And a new Blu-ray by Warner Home Video goes a long way to proving why that's the case. The saturated colors and epic setpieces that dominate the film's mise-en-scène are reason enough to sit back and enjoy the spectacle. But Peter Ustinov's scenery-chewing performance as the last Roman Caesar, Nero, is another great justification. This film was the template for future movies of its ilk, and should be seen for that if for no other reason. Like The Robe (1953), or Ben-Hur (1959), Quo Vadis is based on a historical novel that examines the nascent religion of Christianity through the eyes of an outsider. 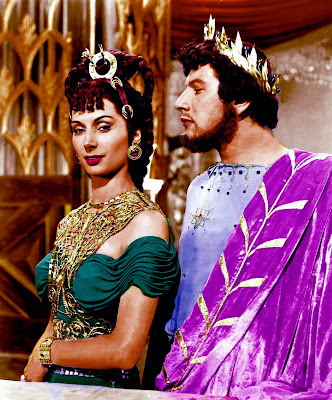 Here it is loyal Roman commander Marcus Vinicius (Robert Taylor), who falls in love with a Christian slave, the beautiful Lygia (Deborah Kerr), while struggling to remain loyal to the increasingly mad Emperor Nero. Lygia's entreaties for Vinicius to join her in following Christ's teachings are initially dismissed. But as the Roman civilization's descent into populist vulgarity begins to mirror Nero's own mental decline Vinicius starts to see the truth of Lygia's beliefs. Like in later epics, Christ is depicted from behind or as someone partially offscreen. Notable historical figures make extended cameos, mixing with the fictional characters. These include Petronious (Leo Genn), and the prophets Peter (Finlay Currie) and Paul (Abraham Sofaer), in addition to Nero. Ustinov steals the movie with his performance as the petulant last Emperor of Rome. At once haughty and crass, Nero is obsessed with adding to his already well established grandiosity. Frequently, he does this by diminishing others, be it in his ill treatment of his courtiers or in the execution of both his mother and wife (before the events depicted in the film). But as the fledgling Christian religion begins to gain his notice, he saves his greatest ire for them. He devises evil ways of executing them, feeding them to the lions and later setting them aflame on wooden stakes in two memorable scenes in the movie. Ustinov portrays the mercurial Nero in even his most heinous acts as both mannerly and mannered, an effective contrast that serves as a metaphor for the excesses of Rome. Co-cinematographer Robert Surtees, who would later win an Oscar for Ben-Hur, captures the at times orgiastic spectacle of Rome in wonderfully brilliant colors that the above photograph doesn't do justice. This is where the Blu-ray holds its greatest power. It reveals the rainbow of colors that so often fails to be depicted in films about the Roman Empire. One has grown accustomed to the white togas of the Roman Senate so often seen in such films. But as more recent exercises like Caligula (1979) and HBO's Rome (2005-07) have demonstrated, Ancient Rome was hardly sedate when it came to fashion or architecture. And Surtees manages to display all of the glamor and grandeur without the benefit of the widescreen splendor of CinemaScope, which wouldn't make its first appearance until The Robe debuted two years later. Quo Vadis has its flaws, primarily in the casting of lead Robert Taylor. His somewhat anachronistic take on Vinicius seems more appropriate to a low-budget war movie than the world of the ancient Romans. And it's a little more difficult to ignore the star than supporting actor Edward G. Robinson's similar performance as Dathan in DeMille's The Ten Commandments (1956). But Ustinov as Nero more than makes up for it, providing one of the film's strongest moments as he plucks his lyre while Rome burns. Audiences would flock to see the Bibical epic for the opportunity to see often apocryphal historic events play out onscreen. This trend began with Quo Vadis. Still courtesy of Warner Home Video. I've been watching "QUO VADIS?". Sometimes I get the feeling that Robert Taylor was criticized for his performance, because he used his own American accent instead of a European one for the movie's gradiose dialogue. Yet, other cast members used their own British accents. Is it stuck in the minds of many that a costumed epic set anywhere in Europe has to be portrayed by a British actor/actress?